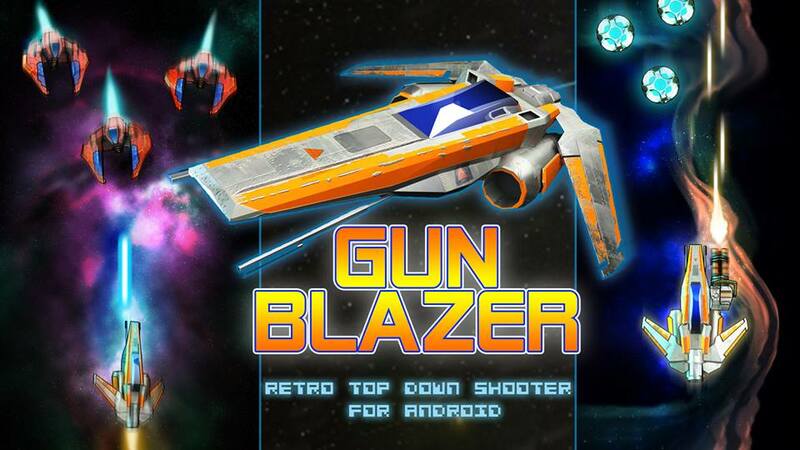 Gun Blazer: strafe, shoot, kill in fiery explosions, and never rest for a second. It’s the paradise for trigger happy retro maniacs. YES, Gun Blazer is another retro shooter, top down viewed with lots of bug-like outer space bad guys who mean trouble, but it’s been inspired by all those gems who defined our childhood and made us stare in pure awe the first time we saw them on the screen of an Amiga 500, a Commodore 64, or an Atari ST.
We are talking about gems like r-type, Galaga, xenon, and so many other countless titles of the same genre. Now one more time you get to be the HERO, the lone pilot flying his prototype through the enemy “horde” of alien predator fighters, minions of an enemy mastermind who remorselessly aims at the total destruction of earth and mankind itself. 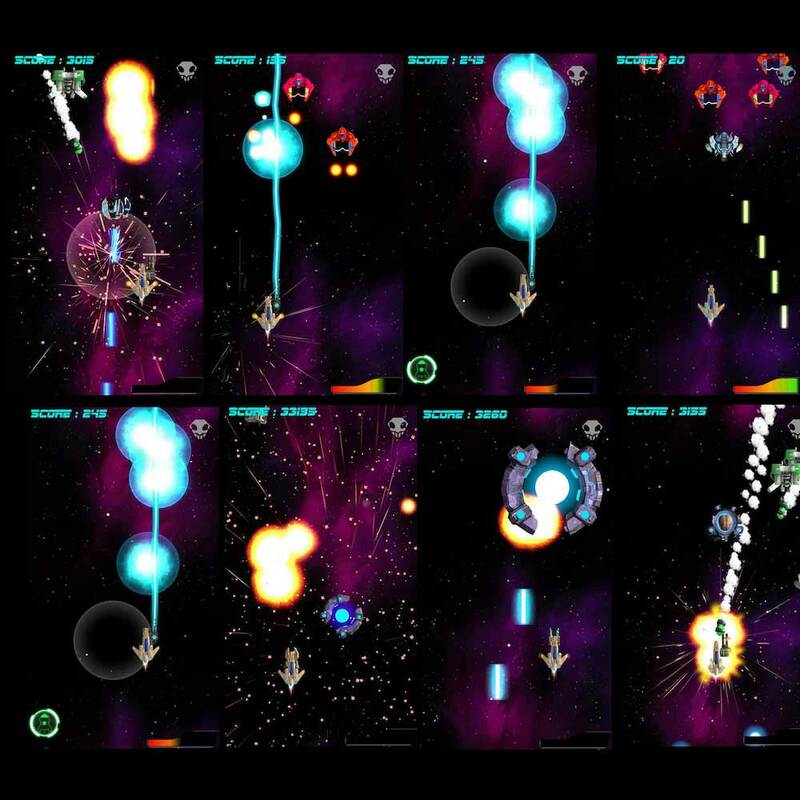 From the first seconds, Gun Blazer cries out “RETRO.” Enemies spawning endlessly, some moving from side to side shooting their blasts of death, others shooting homing missiles at you, or bursts of multiple shots, while some spawn in array and move towards the player vectoring in head on collision, not to mention the meteor storm levels that can be played by collecting the right power-up. 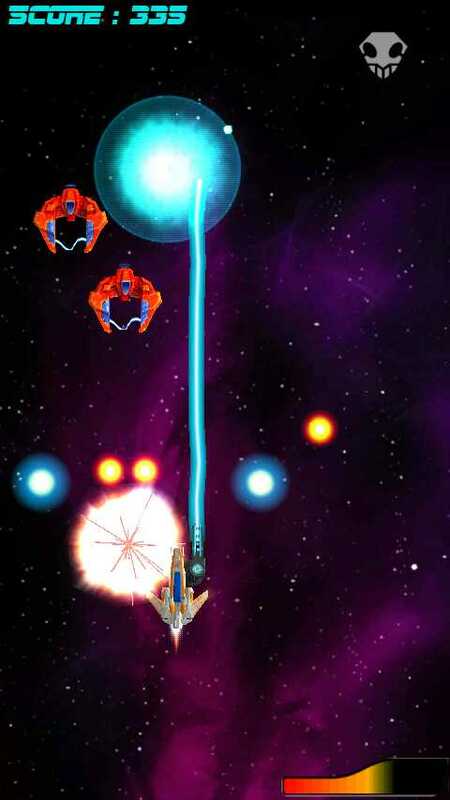 The player has a vast arsenal at his disposal to play with, and every gun is 100% compatible with the retro style Gun Blazer tries to revive – and it does it perfectly, sometimes it makes you run through your pockets for coins to insert into the slot of coin up machine, but instead you are only holding an Android device. Guns are picked up by collecting power-ups spawning several times through the game play. You start of course with the humble single shot (boring) but moving on you can upgrade to double-triple-and quad shot, and after these comes the real fun. You get plasma bolts with splash damage, heavy blaster bolt with both splash damage and high penetration, rapid red bolts (very rapid), MEGA triple shot, electro slicing ray, homing missiles, and rockets. Also, there are two side-arms, a Gatling gun firing vulcan ammo at very high rate, and a sentry gun which – in fully automatic action – seeks and points its barrel at enemies while shooting very fast energy bolts at them. There is also the NUKE bomb, pick up that power up and at that instant, every enemy visible on screen will instantly explode with a magnificent fiery end. The difficulty gets harder as time goes by, enemies begin moving faster, get tougher to kill, and spawn in larger numbers. The game is currently released in two versions, a paid one which comes in two long levels, and two BOSS-levels. This version will be updated at the end of September to a single level version with all 14 weapons, all enemies and very high background geometry (space base, energy traps on walls, turrets shooting fire balls). There is also a free version which limits the game-play at around 6 minutes until the first boss spawns. After killing it you get prompted to get the full version. Six minutes might sound too short, but all new guns are illustrated in this version, and many of the enemies too. The extra guns coming with the new version are the sentry gun, the mega triple blaster, and the electro slicing ray, but still, the current version offers very intense and addictive game-play. The music couldn’t be anything other than metal, electric guitars scratching your ears while killing boogies with a great smile on your face. When it comes to Controls, what is there to be said, simply swipe your fighter in all directions in order to move as your ship keeps shooting automatically. Only the homing missile fires up by pressing a button – visible only when you actually have picked one up. Oh yeah, the electric slicing beam has a limit-time of 90 seconds (yep life is never fair). 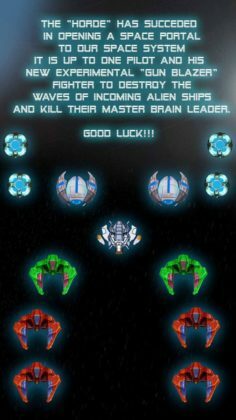 Keeping it short, Gun Blazer is a very good quality retro shooter, there’s is no need to write anymore, go get it and enjoy, and the final version coming up is highly recommended. This article was Published by Edamame Reviews, Written by PixelDrive.